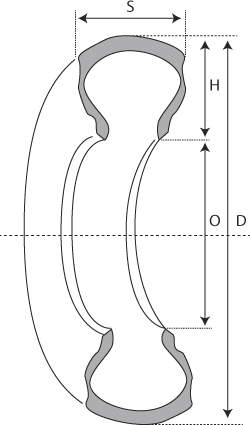 The aspect ratio of a tyre is the relationship of the tyre cross section height (H) to the cross section width (S). In a tyre with an aspect ratio of 85, height is about 85% of the tyre width. 'Low profile' tyres have an aspect ratio of less than 80. The aspect ratio of a tyre is often contained in the size marking, e.g. 130/90 x 16.